What do you look for in a game? Is it brief moments of entertainment? Do you like games that keep you busy while you play them and fade from memory the moment you stop? 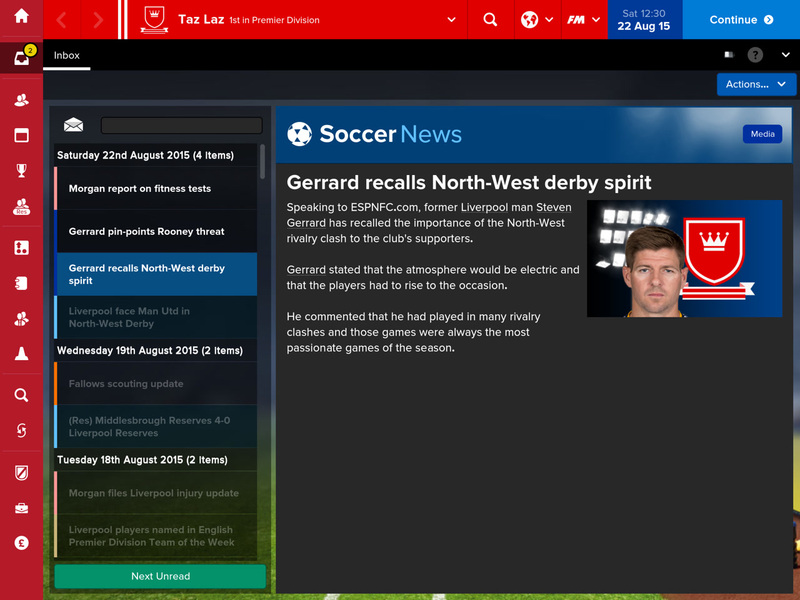 Then Football Manager Touch 2016 ($19.99) is definitely not for you. Why so? Because this is a game about investment, a game that hooks you not with its frantic gameplay (since it’s anything but frantic) but by getting you involved and invested in your career. 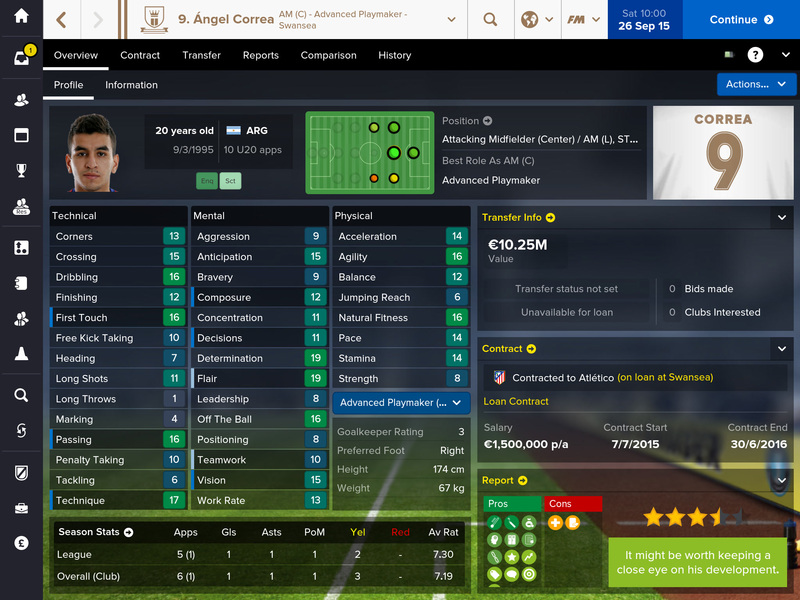 The game makes you feel like an integral part of team your managing; you don’t play FMT 2016 only when you’re looking at your tablet, you’re playing it even late at night in a bar when you’re thinking which player would work where, or whether that wonderkid will finally turn up on matchday. This is a game that will literally expand to fill much of your free time, even when you aren’t actually anywhere near your tablet. While the game will entertain every player who enjoys deep management games, it truly shines when you actually know football and follow it. Why? Because there’s a sense of vindication when playing FMT 2016 that I don’t think I’ve ever gotten from another game. When that no-name player you got into your digital team at the beginning of the year ends up becoming a big signing for a real-life big team merely a few months later, then you can proudly say “I called it." Outside the ‘moral satisfaction’ that such moments bring, they also show the game’s realism in terms of player representation, another reason why playing this game and watching the real sport end up merging together in a fabulous amalgam of sports entertainment. 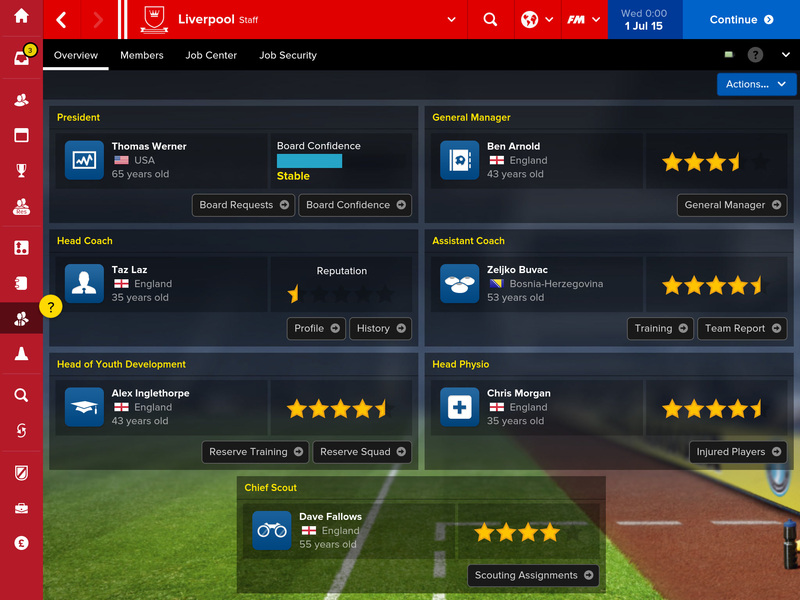 Some might complain that we are getting another premium-priced Football Manager game too soon after Football Manager Classic 2015 ($19.99), which came out less than a year ago. Personally, I like that Sports Interactive released FMT 2016 because this game is by far the better mobile-ready game and definitely worth purchasing even if you own the previous game. The developers put a lot of time in making this game touchscreen ready, and while not everything is perfect about the UI, FMT 2016 definitely feels like a mobile game rather than a hasty PC port. 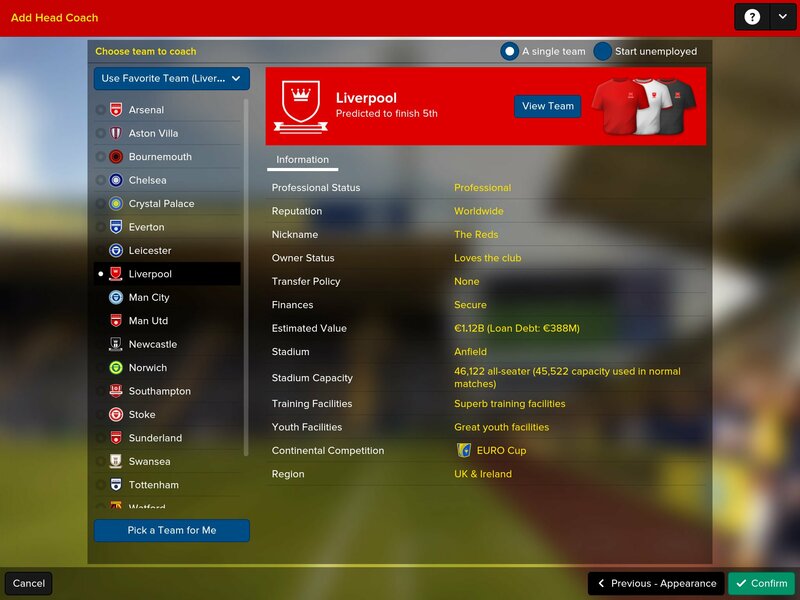 As with every Football Manager game, starting as a new manager means picking one of many, many teams coming from many, many leagues. FMT 2016 offers 51 playable leagues, so you will never run out of variety. Go with a strong team, and you have a relatively-easy ride but also high board expectations; go with a small, lower-league team, and you have a mountain to climb but everyone’s pretty sure you won’t climb it anyway. And you aren’t locked into a team for the duration of your playthrough since if you get fired or you quit, you can apply for other jobs and end up managing a completely different team than your original one. Or, you might even end up coaching a national team, something that changes the game completely since you’re playing in different competitions and have to deal more with scouting and tactics than contracts and training. 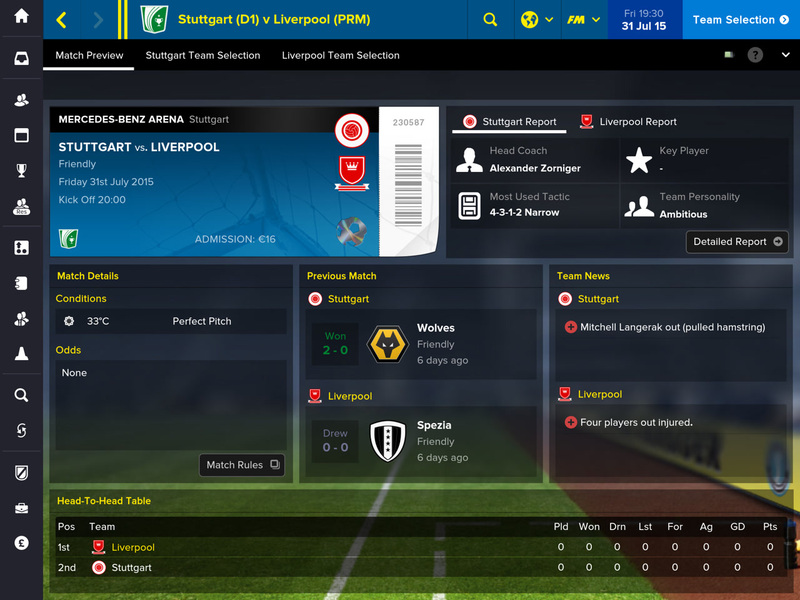 In this year’s version, you can even create your own club and have it play in any league. Trust me, this is even more fun than naming XCOM squad members after your friends because while losing one of those XCOM squad members in battle can be ‘sad,’ being able to complain to your friend that his goalkeeper counterpart stops less shots than a pillow is much more entertaining. The game also offers a Challenge Mode where you are dropped in the middle of (usually) a crisis and asked to turn the team around, a much shorter and more goal-driven way of approaching the game. While it’s easy to get lost in the multitude of options, numbers, and players FMT 2016 offers, the game does a marvelous job offering you plenty of cruise-control options that help you take or relinquish control of the various aspects of running a club as you see fit. 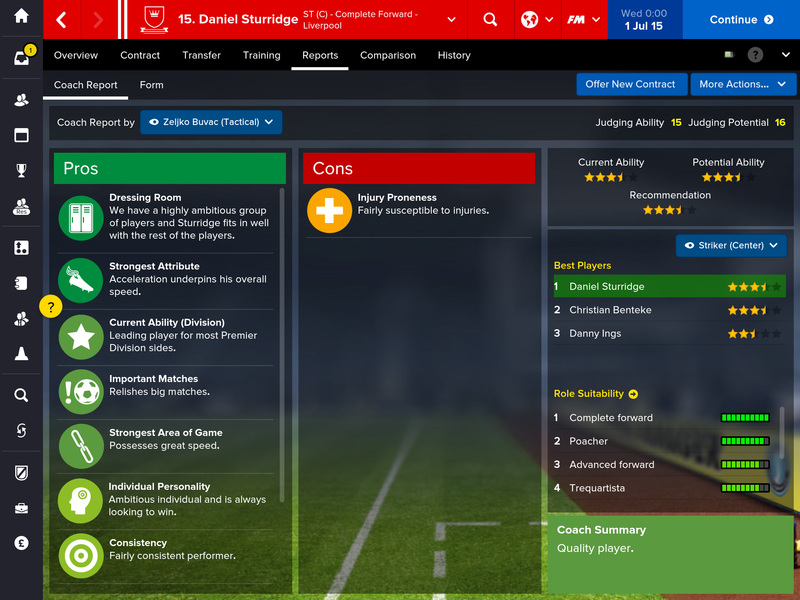 If you don’t want to deal with training players, one tap of the screen later and your assistant is running it. If you don’t want to bother searching for players, you can set your scouts on various assignments. The game assists you even when hunting a specific player; instead of throwing offer after offer at the player, you can tell your assistant to do so, you give him the parameters of the deal you want to make, and then you unleash him onto the world. I don’t think I’ve ever seen an iOS game as complicated as this one allow you to play it either by micromanaging every single aspect or standing back and letting the game help you. At the same time, what I enjoy about FMT 2016 is that you can go half-way; if you feel that a specific player will benefit from a different kind of training, you can go in and set a specific training regime for him while allowing your assistant to continue training the rest of the team. The game’s assistance comes in degrees, and this enables players with different levels of familiarity with the franchise and different levels of dedication to enjoy FMT 2016. The game’s accessibility is definitely helped by the much-improved interface compared to the previous tablet iteration of the game. 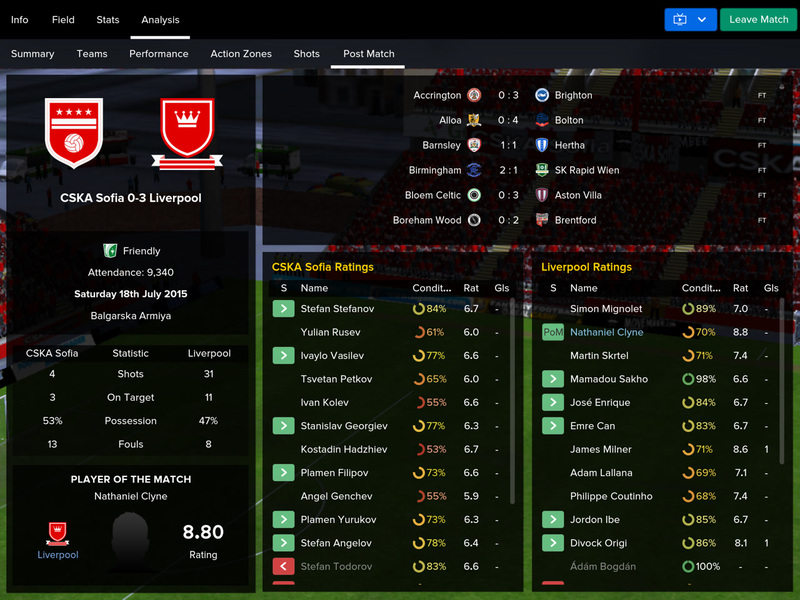 In most aspects of the UI, SI has made the interface much more accessible, with the most prominent example of this change being the Matchday screen. 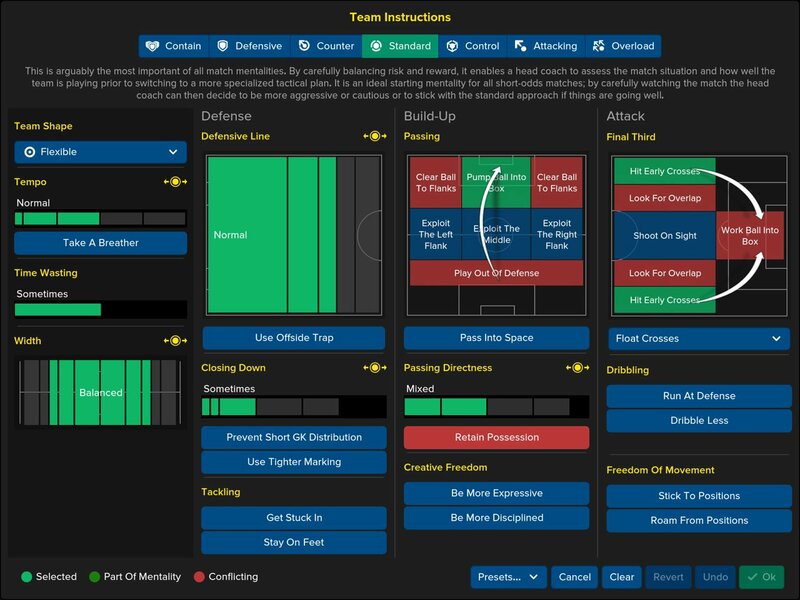 Your team instructions are now broken into very informative screens that show you how your instructions will be realized on the field. For instance, showing you a visual representation of the option ‘Look for Overlap’ is great both for making the game more visually pleasing and for helping those who lack familiarity with the sport. Most buttons are larger than the last iteration too, and the players can be dragged around the Tactics screen more easily. The other way SI improved the interface is by making really excellent use of the iPad screen’s real estate and filling each screen with as much information as possible without crowding it. 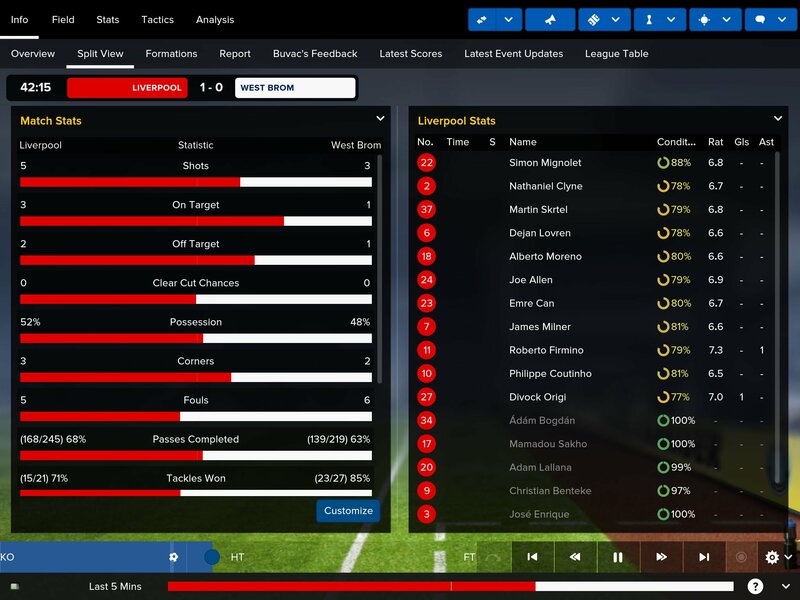 This saves you from having to flip back and forth between screens constantly, an issue that’s all too present in Football Manager Mobile 2016 ($8.99). There are, still, some issues with the game ignoring some taps, like when you try to fiddle with a contract offer; I wish SI did away with plus and minus icons that require a minimum of 20 taps because they really are a pain to use. Going back to the information aspect of the game, I will be forever grateful for SI’s decision to make information like which players are tired or lacking match fitness available in the team’s main screen. Those who haven’t played previous iterations of the game (or haven’t played Football Manager Mobile 2016) will really not understand the frustration of having to go check every single player in your roster one by one to see whether they are fit to play at their maximum capacity. FMT 2016 fixes this issue (and many like it) by cleverly finding ways to give you all the necessary info in as fewer screens as possible. Seriously, you can’t understand how much time well-organized information can save you in a game with a billion numbers and stats. Speaking of numbers and stats, as I’ve discussed in my review of Football Manager Mobile 2016, many call Football Manager games ‘spreadsheets’ because of how often you end up comparing a stack of numbers with another stack of numbers. SI over the years has done so much to humanize your players that is quite unrepresentative of the current state of the franchise to call it a spreadsheet. Your players have very complex personalities (to the point where you’ll want to punch more than a few of them over the course of your career), very specific pros and cons that can be related to the players’ athleticism or personality, and preferences to where they want to play and what kind of position they expect their team to be. Fail to sign the right kind of players, and you’ll end up with a bunch of unhappy brats who play well below their true ablities. For instance, if you sign a highly ambitious player but you are just a mid-league team, expect him to get disillusioned pretty soon. Fail to treat your players like human beings, and you’re guaranteed to have a dysfunctional team on your hands. The only unexpected disappointment in the game is how the 3D engine is a huge step back visually. 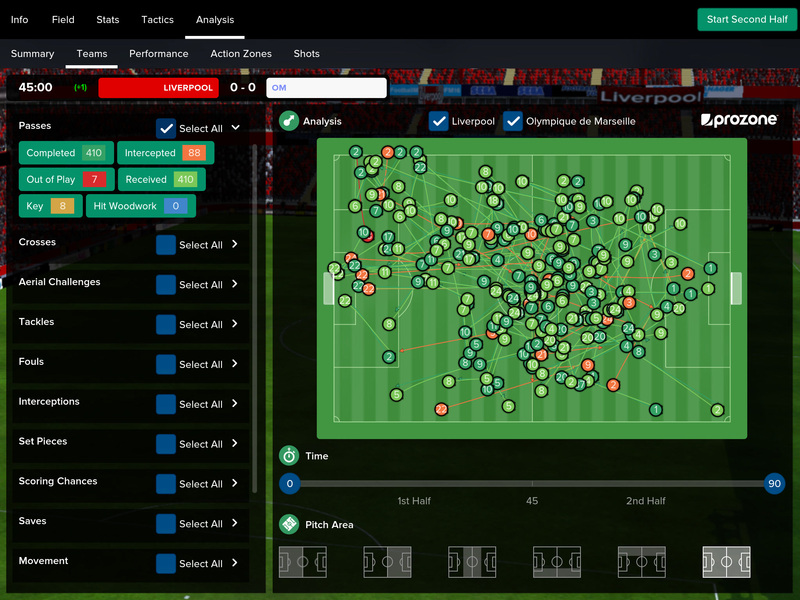 In FMT 2016 you can either watch a match in top-down 2D screen, a detailed text, or in 3D. Last year’s 3D engine was very sharp and while the animations were often a bit wonky, the match looked great. This year, because of what I guess are technical limitations, the game’s 3D engine is so blurry and low-resolution that you’ll have to put an effort to read the players’ names. 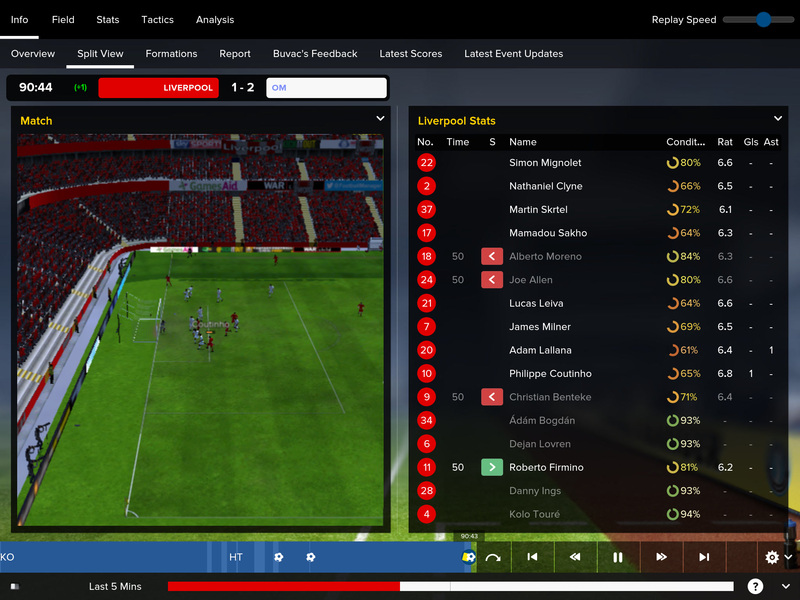 I like to split my matchday screen in two, having my players’ stats on the one half and the match in 3D on the other half (by the way, the game still doesn’t offer the full 90 minute match in the 3D engine). When I split the screen that way, I can’t really enjoy the 3D match because of the low resolution players and field. Yes, the game still offers many ways to watch that match (different cameras and so on), but the blurry 3D engine really is a let down. Despite the 3D engine disappointment, the game still stands as the king of manager games on iOS and an extremely-easy recommendation to anyone even remotely interested in sports. The game’s depth is probably incomparable to anything on the App Store, its replayability probably unmatched too, and the entertainment it offers ranks up with the best gaming experiences I’ve had on any platform. 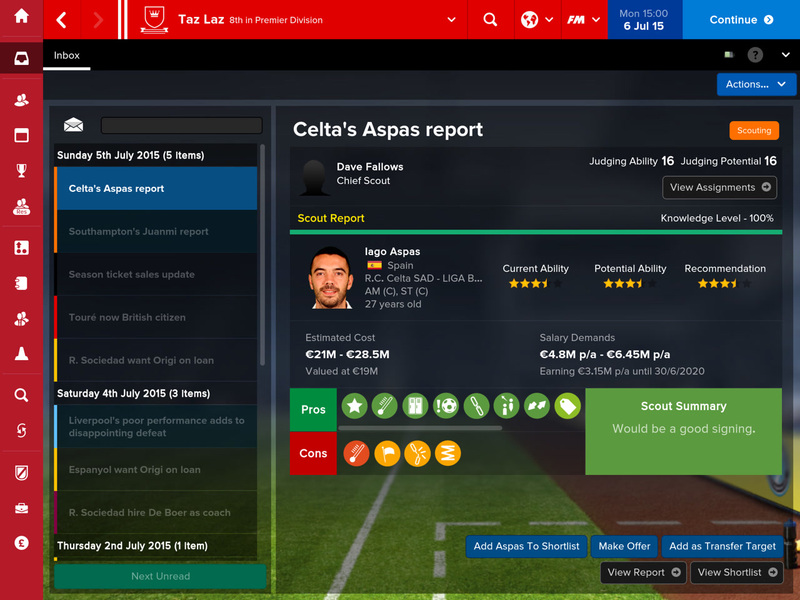 SI has put a lot of work to make the game play better on tablet, and it shows as it’s definitely the most tablet-friendly manager game to date. Be warned, though, that the game only plays on the iPad Air 1,2, iPad Mini 2,3, and 4, and the iPad Pro, but even my iPad Air 1 struggled to keep up at times, and I faced occasional (but relatively-rare) slowdowns. The game offers cross-save compatibility with the PC version of Football Manager 2016, a fun feature if you happen to own both. The game’s $19.99, and if you complain that a game as deep and as rewarding as this shouldn’t cost that, I think you might want to reassess your views on game pricing. There are IAPs, but they are the type that simply make the game easier to play (you can poison the other team’s players, become literally impossible to be sacked, and so on). All are completely unnecessary, but if you don’t want the game to be too punishing or simply like to pay to have an easier time, you have that ability. I’m very excited to finally have in Football Manager Touch 2016 what I think is the best Football Manager version I could have hoped for, and despite my niggles with the 3D engine and some interface issues here and there, this might be my game of the year.